Sending files--especially sizable art or photo files--to clients and editors can be problematic. Corporate firewalls simply don't like large e-mail attachments (or, in some cases, any attachments). And, yet, we're not about to spend the time or the expense to ship the files via a physical courier service. Our solution? We use an online service called YouSendIt (various pricing; a free plan exists). And, to make matters even easier, we use their free download software, YouSendIt Express. YouSendIt Express looks like a typical e-mail message--but when you send files, instead of sending attachments that might be blocked by the recipient’s firewall, they are hosted on a private folder on the YouSendIt server, where your recipient can easily access and download them. YouSendIt Express, a tiny, standalone program, is very simple to use. It's similar to writing a typical e-mail message. Simply double-click the icon to quickly launch the program, select your recipients, type in a subject line, add an optional memo and select the file(s) or folder you want to send. Then, click the SEND button. The recipients will receive an e-mail from you with a link to a private folder, to download the files to their computer. Although the YouSendIt Express software is free, the features and cost of options vary depending on the type of account you have. For instance, with a free Lite account, your optional memo is limited to 100 characters, you can send files of sizes up to only 100 MB each, and you can send only one file at a time. With a $10/month Pro account, your files can be up to 2GB and you can send multiple files in one memo. In addition, a Pro account lets you track who downloads your files and when, has an option for setting an expiration date for your files, and provides a drop box where others can send you files. A Business Plus account ($15/month) offers even more features, and is designed for teams of at least 2 people. (Corporate Suite Accounts are prices based on the number of users from $1,000/year for five users to $3,000/year for 25.) For instance, with the Lite and Pro accounts, you pay on a per-use basis for features such as a Password-Protected Secure Delivery ($4) or Return Receipt ($4); with a Business Account, they're included. 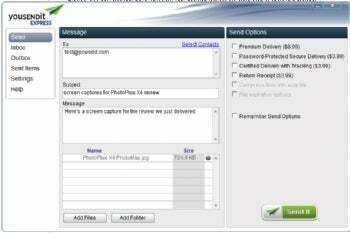 YouSendIt Express is a no-brainer choice for sending files to clients. It's free, while saving time, effort and money.